The Baroque period spanned the years between 1600 and 1750. Baroque painting first appeared in Europe and spread quickly. As historians of the Rocco and Pre-Modern influence studied Baroque art, they often referred to the style as grotesque. However, it is much more than that. It is a style that introduced passionate movement in art through the evolving use of paint and brush strokes. A Baroque masterpiece can easily be re-created by using Baroque period techniques. It was during the Baroque period that large, heavy brush strokes were first introduced. The Baroque artist used paint not simply by painting with it but by integrating it into a piece through the use of brush strokes that conveyed an enormous sense of movement, energy, and tension. To create a Baroque piece, an artist must use paint as an element of texture and dimension. This can be done with the use of a palette knife. Large decorative elements that imply motion should also be used. Another characteristic is a sharp contrast in light and shadow. This can be accomplished by introducing natural elements such as dark clouds and lightning into the painting. The Baroque artist commonly used these elements from nature to emphasize religious themes, and they should be used this way for re-creation. 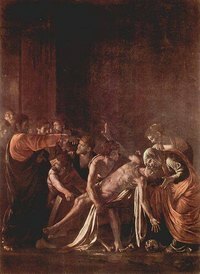 Baroque paintings should have an intense spiritual theme: martyrs, ghosts, or anything associated with the Catholic church. Countries such as Italy, Spain, and France that have had a strong religious influence on the world were often used as the setting of a Baroque piece. When re-creating Baroque-style artwork, the artist should integrate the natural elements of these themes and countries into his painting. An artist must make sure that the Baroque-style painting has a sense of infinite space, which is created by emphasizing a true use of perspective and good image placement. Realism is also a characteristic that must be used when creating a Baroque-style painting. Use figures with individual characteristics and expressive personalities. Viewers should be able to understand what the people depicted in the painting are thinking. The use of realism should also extend to the depiction of clothing and skin textures. Examining the work of famous painters can help the artist understand technique better than any amount of education. There are many excellent examples of Baroque artists, but some excel above others. Artists and works that are worth studying include Anthony Van Dyk's "Rinaldo and Armida," Caravaggio's "Deposition," Peter Paul Rubens' "St. George and the Dragon," as well as his "Garden of Love," and Rembrandt's the "Sacrifice of Isaac."